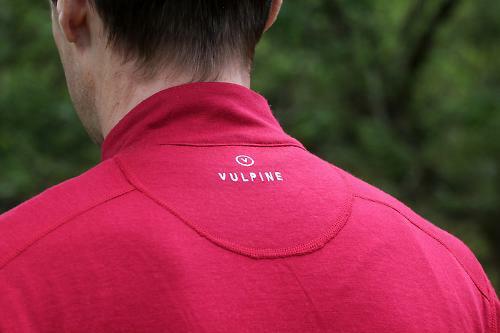 The Merino Alpine Jersey is another example of Vulpine's fine eye for detail. They've produced a jersey that you'd be more than happy wearing on your epic Alpine journey as you would afterwards at the cafe stop. Vulpine have a fondness for Tasmanian merino wool and it's not hard to see and feel why. The texture is soft and stretchy allowing for a very good fit. For a jersey that falls into the higher end price bracket you would not unreasonably expect a decent return for your cash. The folks at Vulpine HQ have identified a number of key points that enhance their range. The lack of sewn in labels prevents irritation or scratching, instead this detail is printed. The silicone gripper is on the rear of the garment to help keep it in place when you are on the bike. Flatlock stitching is used for the same reason as the absent labels. The ride qualities of merino are well known. It has a top line in temperature management, moisture wicking and making sure the owner is still presentable no matter how hard they've worked. All these properties are present in the Tasmanian merino. The ability to resist odour is quite impressive and if that wasn't enough it is extremely comfortable. It will also dry quickly. As you might expect in a jersey which features alpine in the name, it is designed to keep you cool. It has a full length zip in a contrast colour, a dock to keep the zip pull out of the way and a leather pull for some additional style. On the reverse of the jersey, you have two angled rear pockets with a zipped pocket in-between. Above this rear security pocket there is a reflective strip complete with light loop if you ever find yourself out after dusk. There are other little details that enhance the look of the Alpine jersey. 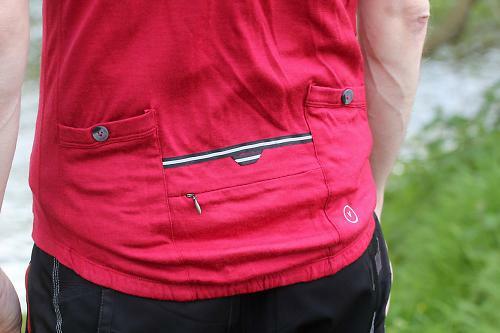 The Vulpine logos are embroidered and the rear pockets have buttons to keep them closed. The old adage of you get what you pay for is very apt. Yes you're paying £80 for a jersey but you are getting plenty of value for it. This is a great looking jersey with a number of technical features that are not immediately obvious. It is only when you use it you appreciate what you have. I can't wait for summer to truly arrive to give me an excuse to wear this more often. The merino wool used in making this jersey is a quality product but the technical features that have been added mean this jersey is much more than the sum of its parts. Throw in the style card and you have something that will be the envy of your riding mates. Anyone after a classic riding jersey for long hot summer rides, preferably european. Great at the basics and has style to match. The merino wool works very hard to keep your temperature stable, by retaining heat on cooler rides or dissipating it on those warmer ones. It doesn't hold nasty niffs and would look at the cafe stop. You can appreciate the quality of the Alpine jersey just from the feel of it. On closer examination you can see the effort that has gone into designing it with it's neat little touches. Even wearing a pack did not leave me feeling too warm or sweaty. 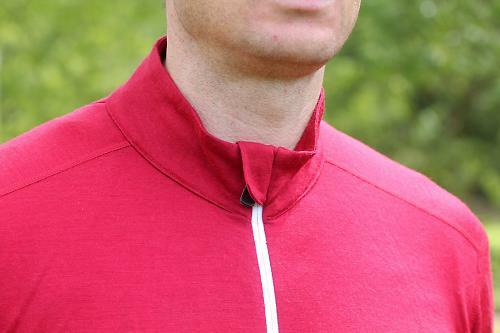 The merino really does an excellent job of keeping you comfortable. With the materials used, the jersey has a decent feel to it that translates into performance and durability. The weight hasn't proven to be noticeable when just wearing the Alpine jersey over a base layer. Having tried this without a base layer, this is a very easy to wear jersey. No itching or intrusion from the seams or material. Given the performance and looks I'm not sure there's much to quibble over. I was very impressed with how well it worked at doing the job it was designed for. The texture of the jersey combined with a full length zip will make this a great top in the summer. Struggling with this - if you want to travel light which means stuffing essentials in your jersey pockets don't overload them. They are quite low to start with and will only sag lower if they are full. You almost feel as if you'd sit on them. Top marks for introducing some neat touches to what could have been a very functional piece of kit. It is a lovely jersey. I bough one last Friday and wore it for a 100km ride Sunday. The inability to carry anything in the pockets is a pretty big flaw though. I have other merino jerseys which are heavier weight and they can sag a bit when loaded but I was constantly sitting on the contents of my pockets on Sunday. They do mention this on the product page on their site but I think they should look at ways to improve this. Moving the pockets further up and/or anchoring them with seams up the back would probably help. If you are riding any distance you need a decent size saddlebag or something as it currently stands. Thanks forzagaribaldi you just answered my question. Apologies if I missed it but is this 100% merino? Seems crazy they've made it out of pure Merino. I've seen how much pure wool jerseys stretch, not surprised to hear from an owner that they can't really store things in the pockets, which makes them a bit pointless. Hmmmm 9/10 for a jersey with pockets you can't use.. I guess paying for advertising must help..
Having worn out 100% merino jerseys in a season of light use I would question the durability too..
How fiddly are buttons when you are opening pockets by feel, and with one hand? Dumb design choice. I suspect the only reason for buttons is to stop the pockets from sagging. Superb attention to detail my a**. Hi de hi campers! Uncle Nick, designer of the Alpine. I very deliberately made the jersey from 100% merino because of its considerable comfort compared to stinky shiny synthetics. The only downer (and also an advantage elsewhere) is it is very stretchy. This informed the design of the rear pockets, which are deliberately less capacious than those of a 'race' jersey. This is not a top to load with 100 miles worth of energy bars, gels, a jacket, tools, wallet, keys, mobile and furry mascot and we say this on the site, as described above. This is a jersey for super plush riding and sitting in the pub without stinking like a fisherman's chamois after a vindaloo and a little light Paris-Bordeaux. The durabilty is (hi nemesis @FixieGirl!) very good indeed. The merino is just about as non-bobbling as it gets, and as long as you steer clear of riding through brambles or washing with knives, will last for many years. Lastly @nbrus, the buttons are there as a simple classic closure and because this is pretty. Thank you for the offer of superbly detailing your arse, but I am married and it presents many potential legal issues that I would like to avoid. Its a great shirt which looks and feels fantastic. I would of liked to of seen maybe some sort of strengthening down the back. No mistake guys, designed that way. Researched and developed before hitting market, we don't just chuck 'em out there! Thanks for the kind words. Are you saying buttons on rear pockets are a good idea? Really? Not sure alpine is a correct name for the jersey. Typically when riding in the alpes you need to take an overjacket and arm warmers /knee warmers and food /money. Not sure where you would put all that.